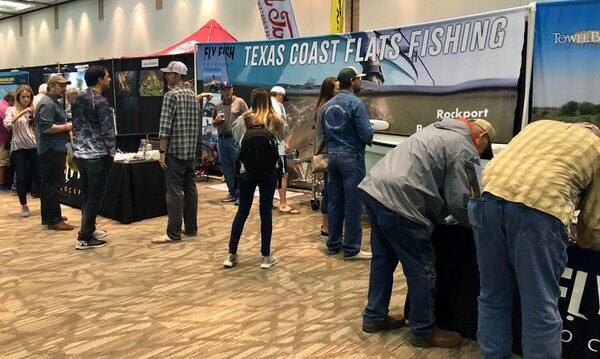 Some of the crew here from Fly Fish Rockport made the trek up to Plano, Texas again last weekend for the Texas Fly Fishing & Brew Festival. Now in its third year, this has quickly become one of the larger events for the Texas fly fishing community. And certainly it is the largest for the Dallas/Fort Worth area. So Capt. Jeff and Capt. Gibson packed up, grabbed a shiny new Towee Calusa, and headed up to Plano. This event is a two-day show combining all things fly fishing, with a number of micro breweries. Visitors are able to sample a variety of craft beers, while checking out all the latest gear, gadgets and fishing venues from around the globe. There is also a number of instructional courses, casting lessons and demo sessions on the casting pond. So plenty of stuff to keep folks entertained. Fly Fish Rockport has a long standing relationship with the good folks over at Sweetwater Brewing, who also are a big part of this event. We were again happy to work with them this year. Patrons of Fly Fish Rockport were able to get any of the fine brews from Sweetwater Brewing for free. Not a bad gig for sure! Capt. Jeff did a couple of lectures for those wanting to learn more about fly fishing for redfish on the Texas Coast. He covered some of the basics, as well as some of the more advanced techniques used down here while flats fishing in Texas. The classes were very well attended. And all were rewarded with a free Sweetwater Brew. Overall, it was another good show. It’s always fun to catch up with other friends from around the country, and world. And huge thank you to all of those who swung by to say hello to us. Great to see returning clients there, and of course meet new ones as well. This event marks the end of our trade show and event season. It’s often hectic, mixing these into the schedule. Especially this time of year. But they are a bunch of fun and certainly a good way to let people know about flats fishing in Texas. Now, it’s all ahead full for the entire crew here as Spring fishing is finally upon us. This is a crazy busy time of year. So it’s good to have everyone back on the water and catching fish. But we will certainly be back up in Plano again next year. Hopefully with some more cool stuff to give away and free beer. Thanks again to all who hung out with us there. Hope to see you on the water soon!